New Billet Aluminum Low Profile Napa 4003 Wix 24003 Fuel Filter 1/2-28" 1/2" UE. 14mm 18mm Male Female Glass Adapter Joint Slide Bowl Extension various size UE. Repeater Size: 23cm 15cm 2cm(9.05in 5.9in 0.78in). Specification: Up Link Down Link Frequency : 890~915MHz 935~960MHz 1710~1785MHz 1805~1880MHz Power : -70~-40 dBm / FA(1.23MHz) Gain ： 60±3dB 66±3dB Max Output Power： 17dBm / Total power 17dBm / Total power Impedance： 50Ω Seclusion： >70dB Power Supply： AC 110/220V(used AC/DC Adapter 12Vdc) Compact Design： Indoor Use Item Diemension： 210 x160 x 20 mm. Features: High gain, easy installation and operation. Full-duplex, single-port design. Use ALC technology, adjust extent automatically. LED Light Working & Signal Condition Indicators. Big linear power, control intermodulation & scatteration stably. Dependability stand by GB6993-86 standard. Compatibility of electromagnetism according with ETS300 609-4. Specifications: Downlink DCS1805-1885(MHz) Gain(dB): DCS Up link 53 DCS Downlink: 58. Repeater Size: 23cm 15cm 2cm(9.05in 5.9in 0.78in). The repeater device features easy installation & operation, built-in indoor antenna and no interference. Type: Signal Booster. Power: -70 ~ -40 dBm / FA(1.23MHz). Repeater Size: 23cm 18cm 2cm(9.05in 7.08in 0.78in). The repeater device features easy installation & operation, built-in indoor antenna and no interference. Type: Signal Booster. Power: -70 ~ -40 dBm / FA(1.23MHz). The repeater device features easy installation & operation, build-in indoor antenna and no interference. This device is strong to boost multiple users with maximum power, is cost effective solution with weak outside signal. New Billet Aluminum Low Profile Napa 4003 Wix 24003 Fuel Filter 1/2-28" 1/2" UE. 14mm 18mm Male Female Glass Adapter Joint Slide Bowl Extension various size UE. Repeater Size: 23cm 18cm 2cm(9.05in 7.08in 0.78in). This Single Band Repeater kit is designed for 70dB 1800MHz DCS Band ;it is only a repeater,it does not include indoor and outdoor antennas and all hardware for installation. Small Size, Light Weight, Beautiful Repeater. 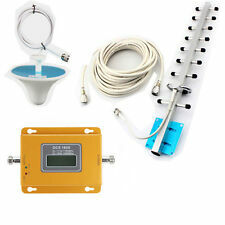 White Color Dual Band 2G GSM 900MHz 3G WCDMA 2100MHz Cell Phone Signal Booster Repeater Amplifier. GSM900MHZ 2100MHZ dual band repeater ,amplify double signal. Cellular communications can not work well due to leak of signals,the repeater. GSM 2G 3G 4G LTE signal booster ,expand 2G GSM UMTS 2100mhz LTE 1800 signal ,Work for 2G 3G 4G. New make the repeater work better, the size of this repeater is designed very big and heavy. This repeater can work with 4-6 indoor antennas. GSM / DCS 900/1800 Booster ONLY! - This repeater is suitable for GSM 900 and GSM/LTE 1800, can boost voice and 4G data. 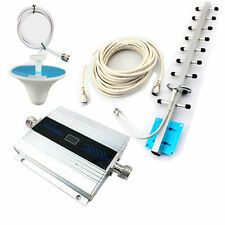 - GSM 900mhz 1800mhz dual repeater gsm 900 1800 dual band signal booster. - 1 x GSM 900mhz 1800mhz Dual Band Booster ( without outdoor and indoor antenna ). GSM 900mhz 1800mhz dual repeater gsm 900 1800 dual band signal booster. - This repeater is suitable for GSM 900 and GSM/LTE 1800, can boost voice and 4G data. - 1 x GSM 900mhz 1800mhz Dual Band Booster( without outdoor and indoor antenna ). 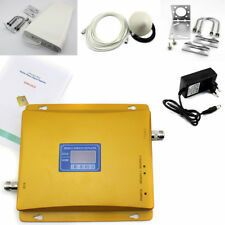 GSM 900mhz 1800mhz dual repeater gsm 900 1800 dual band signal booster. - This repeater is suitable for GSM 900 and GSM/LTE 1800, can boost voice and 4G data. - 1 x GSM 900mhz 1800mhz Dual Band Booster ( without outdoor and indoor antenna ). 1 x DCS 1800Mhz cellphone repeater (LCD SCRN). The repeater device features easy installation & operation. 1 x yagi outdoor antenna. LED Light Working & Signal Condition Indicators. So In the case we suggest you donn't buy this item. The Cell Phone Signal Booster supports GSM/dcs1800 ,it works with GSM/DCS 1800MHz 3G network,it supports any wireless operator in the frequency range of 1710 ~ 1785MHz and 1805 ~ 1885MHz. It could only strengthen cell phone signal, could not produce cell phone signal. For example, if your outside signal has 0 bar, it can not work or bring you any signal. Frequency Range GSM 890~915MHZ 935~960MHZ. 1x Booster Unit. Connector Type: N Female. Make sure the frequency band of your carrier is suitable for this item.Otherwise the device can't work for you. Otherwise the booster can not improve your signal. Frequency Range GSM 890~915MHZ 935~960MHZ. Booster Specification 1 Indoor Panel Antenna. 1 Outdoor LPDA Antenna. Connector Type: N Female. Frequency Range Uplink: 890~915/1710~1785/2500~2570MHz. Connect outdoor antenna to "BTS" in repeater via cable. Then,through cable sent the signal to the indoor repeater. The repeater accepts and improvs the signal. GSM 900 DCS/LTE 1800mhz Band 3. Fix up outdoor antenna(usually use the yagi antenna) on the housetop and point to signal tower. Wltoys 10428-D 1/10 Scale 2.4G 4WD Electric Brushed Crawler RTR RC Car Gift S. Repeater Size: 23cm 18cm 2cm(9.05in 7.08in 0.78in). The repeater device features easy installation & operation, built-in indoor antenna and no interference. It works with worldwide GSM/EGSM 900MHz and DCS 1800MHz Networks, This device is strong to boost multiple users with maximum power, is cost effective solution with weak outside signal. GSM 900/1800 Dual Band Cell Phone Signal Booster Repeater GSM 900/1800 4G Wireless LTE Amplifier. 2018 Newest CDMA DCS dual band rpeater ,850/1800MHZ Signal Improve. Cellular communications can not work well due to leak of signals,the repeater. 1 x Dual Band CDMA DCS Signal Repeater. LCD display can indicate the signal status Double signal bar showing. Pls confirm the frequency or band in your area before releasing the order. If frequency doesn't match, it can't works. (Cellular communications can not work well due to leak of signals,the repeater. 1 DCS 1800MHz signal repeater. 3) Connect indoor antenna(s) to “ BTS ’ port in repeater machine through cable also. The repeater makes the signal stronger in places with poor signal coverage such as.